The EFG D30 – a new stacker solution. JUNGHEINRICH is the first to launch an electric counterbalance forklift truck with a rotating cabin. This entirely new stacker solution - a further development of the "Future Truck" study presented by Jungheinrich in the year 2000 - is based on a Jungheinrich battery-powered truck from the "4" series with a lifting capacity of 3000kg. Available from RED Australia , the EFG D30 is mainly distinguished from its "mother", the EFG 430, by the rotating cabin which can be rotated 30 degrees to the left and 180 degrees to the right with the Multipilot control. After the load has been picked up, the driver can drive off straightaway and at the same time rotate the cabin up to 90 degrees. This position offers an adequate and comfortable view to the rear for short and medium-long distances - comparable with a reach truck. For travelling over longer distances, the driver can rotate the cabin to 180 degrees -this however is only possible when the truck is stationary, due to the automatic switchover function for the direction of steering and the direction of travel. The rotating cabin truck EFG D30 offers the same advantages as all its "relations" in the series of battery-powered trucks from Jungheinrich. 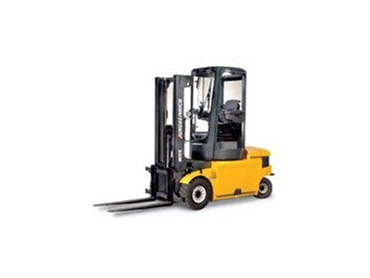 Thanks to the use of three-phase ac technology the truck achieves performance values comparable with those of the IC engine powered forklift trucks. This truck, which weighs in at less than 5,100 kilograms, can reach speeds of up to 20 kilometres an hour. Plus the highest handling turnover rates due to its peak values for acceleration, travel and lifting. The lifting speeds with and without load are 0.50 and 0.67 metres a second respectively. Lying between these values are the lowering speeds - 0.56 and 0.57 metres a second respectively (with and without load). At the same time longer operating times are guaranteed through optimum efficiency as well as through effective energy recovery.